One of the other Lindstromites in Korea, Ashley, has invited me to her city in western Korea plenty of times but I never made it. The other day she mentioned duck cooked in pumpkin, so of course I needed to come! 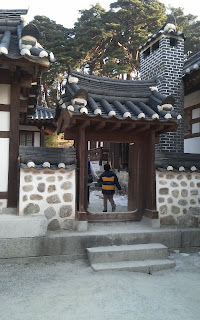 Her place was out in Gangwon Do in the city of Gangleung- about three hours by bus. 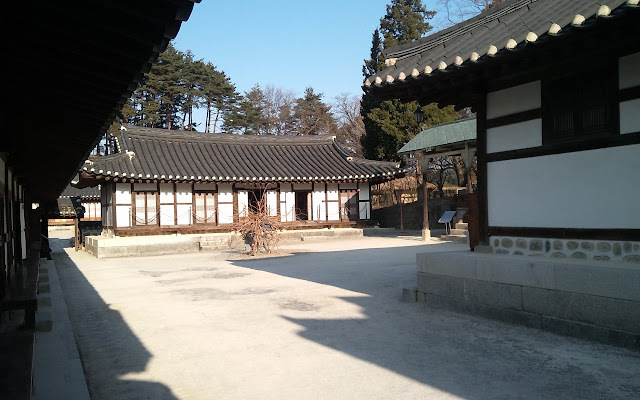 Small by Korean standards ㅡ 150,000 ㅡ the downtown area itself was nothing to write home about. The duck we had for dinner, on the other hand, was phenomenal. My gourmand friend, Catie, said it was the best duck she ever had and I agree that the two flavors blend perfectly. 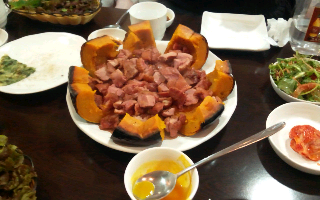 Of course the group needed some alcohol to go with the meal, so we ordered corn-based dongjuju which was served in a large bowl with a gourd-shaped spoon. Dinner was followed by a walk along the East Sea. Although the weather in Gangwon Do is far from pleasant at this time of year, the fresh air and sound of the waves breaking on the shore made for a refreshing break from chaotic Seoul. We finished our walk with a coffee at one of the ubiquitous cafes along NamHangJin Beach. 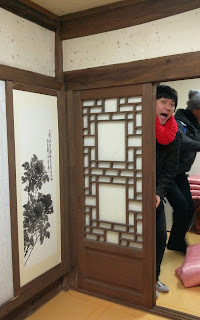 Taxis, though hard to find, are quite cheap in Gangneung so we traveled to our lodging, kindly arranged by Ashley, and were shocked to see the beauty of the accomodations that we were only paying some ten dollars for. I have visited Korean traditional villages but never slept in a traditional house, or hanok, during my year and a half in Korea. With sliding paper doors and beautiful inkbrush designs, the hanok would satisfy anyone`s love of the orient. The sleeping pads were just as comfortable as a bed and my only complaint is the distance to the bathrooms. Definitely a place to take your family.